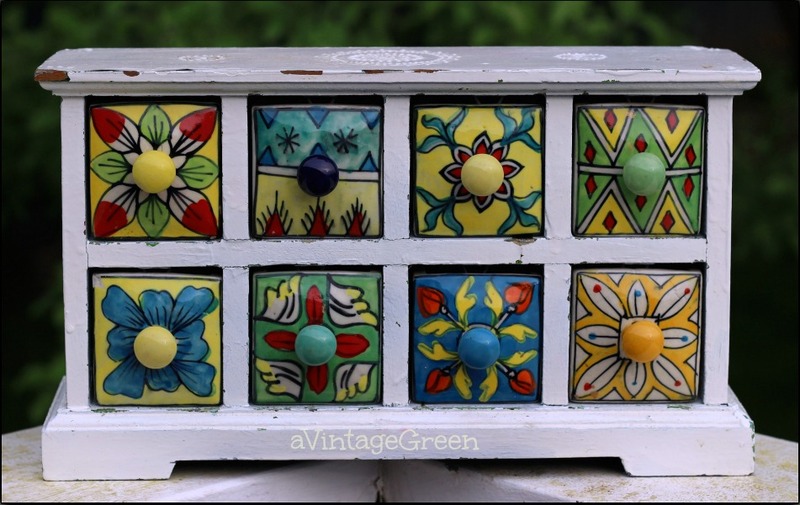 A garage sale find, a small eight drawer cabinet, looked lovely but was heavier than expected - and when DH scraped at the gold on one drawer he discovered a design under the paint. The circular round dots that decorate the frame were also intriguing. A closer view of the small drawer with some of the paint scraped away. DH picked up some furniture stripper to help with removing the gold paint. 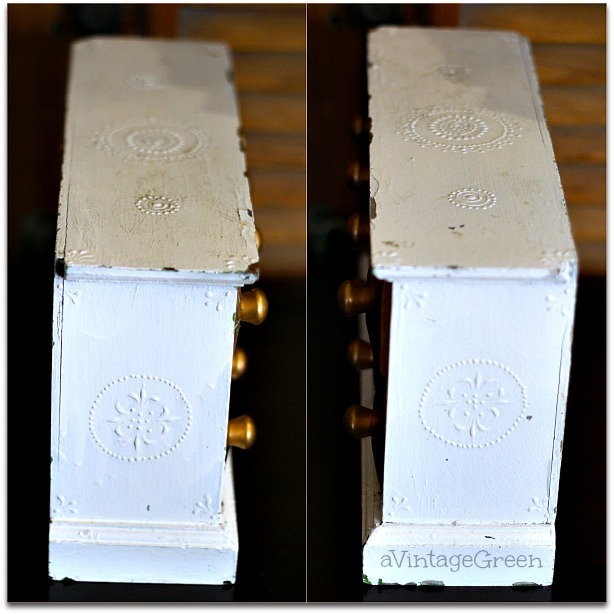 Painted Circa 1850 furniture stripper on each piece, left on for a couple of minutes, put detergent on each piece and washed stripper off. Final cleaning with Spray Nine and rubbed the rest of the gold paint off. Most came off easily, washed with detergent and removed remaining residue. Stack of drawers after cleaning. What did we learn about this small 8 drawer cabinet? 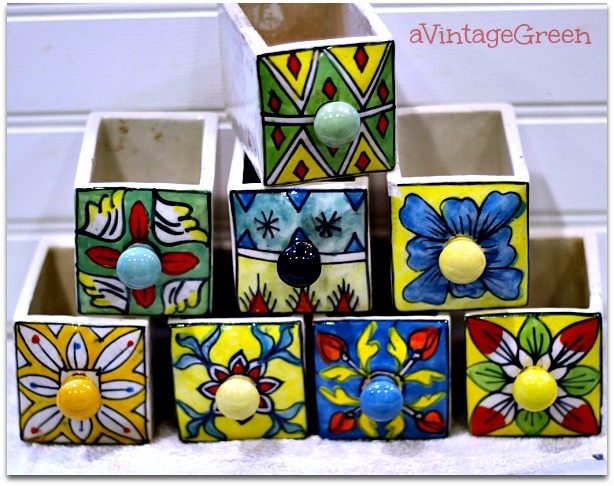 The drawers are made from slabs of clay, glazed white with decoration on the front. Each drawer is held in with a v shaped clip just inside the rim. 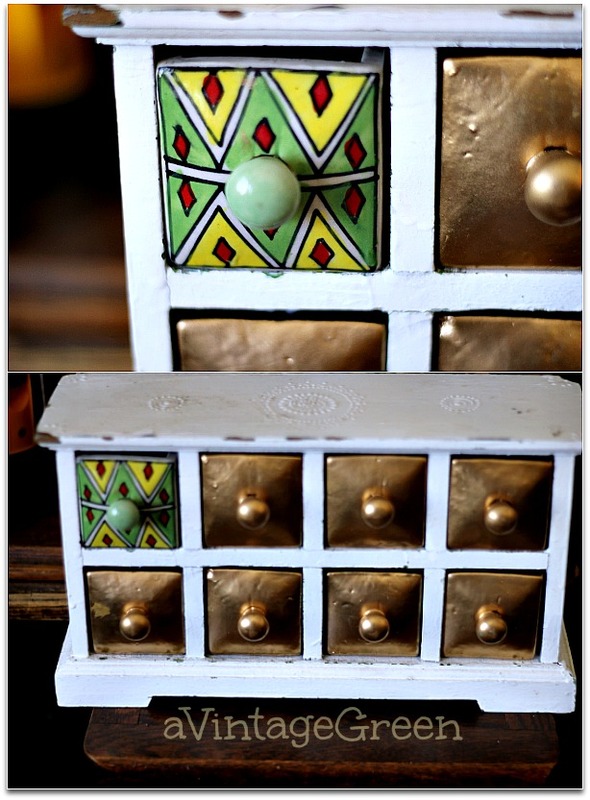 Maybe it is an vintage apothecary cabinet - I found a beautiful one (larger) at Make Me Pretty Again. 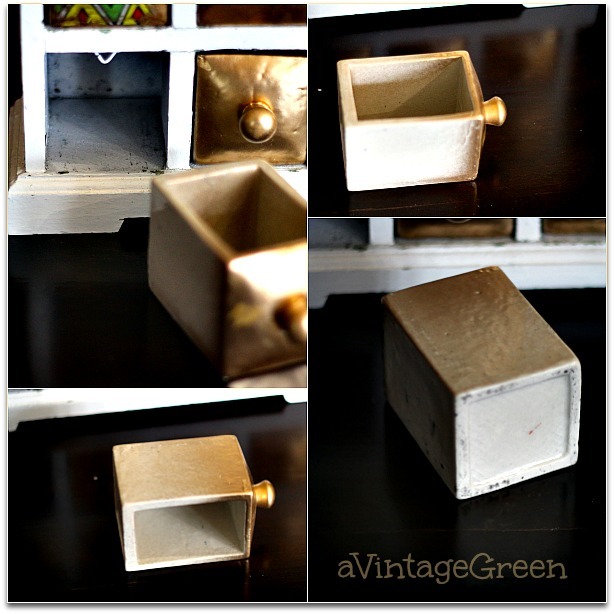 Visit and see how Beth turned her's into a a garden feature as well as a home feature. Most likely though it is a spice cabinet. Close up of first drawer with paint removed. 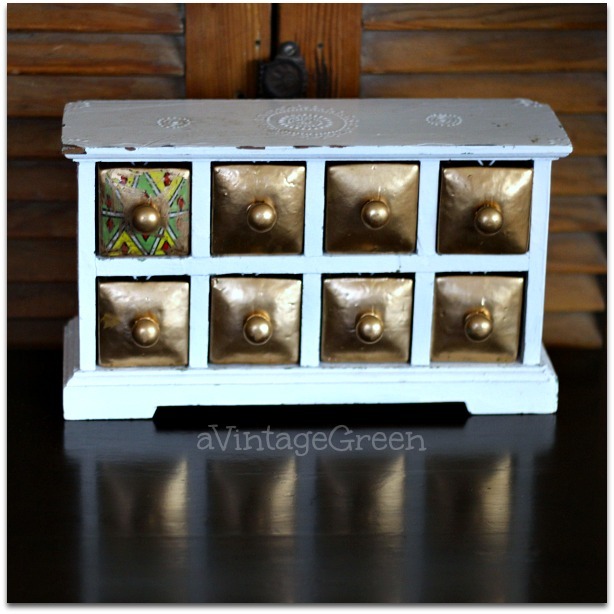 If it is a vintage spice cabinet it is a very beautiful kitchen accessory. There is also that lovely very vintage green paint under the white. This is so pretty!! Hard to believe that someone painted over those drawers. That is a precious piece. 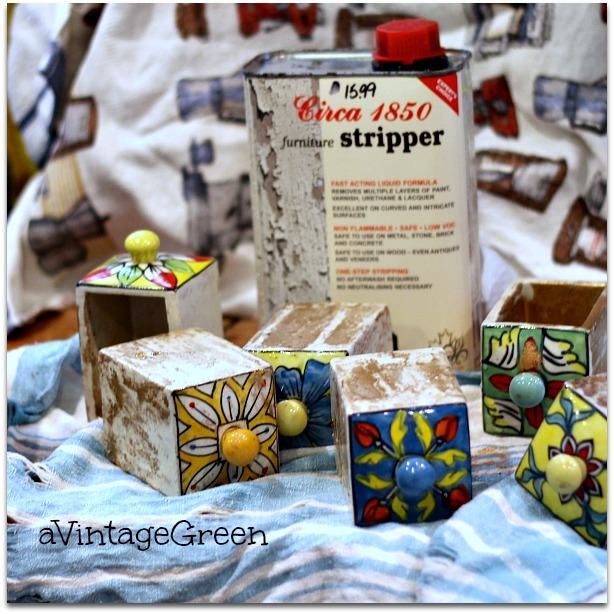 I love that you stripped it and brought out that beautiful beauty of the drawers. What a beautiful and unique piece with colorful designs different for each drawer. Oh my gosh! Why would somebody have painted over those fun and quirky designs? Awesome job restoring them to their former glory. Love your spice cabinet. It is beautiful. Glad you discovered what was under that gold paint. Great job by you and DH. I'm glad you stripped it back as it's far far nicer. Makes you wonder why someone would paint over it in the first place. Well who would have ever guessed? The colors are so pretty. I'm glad you uncovered them. How cute! 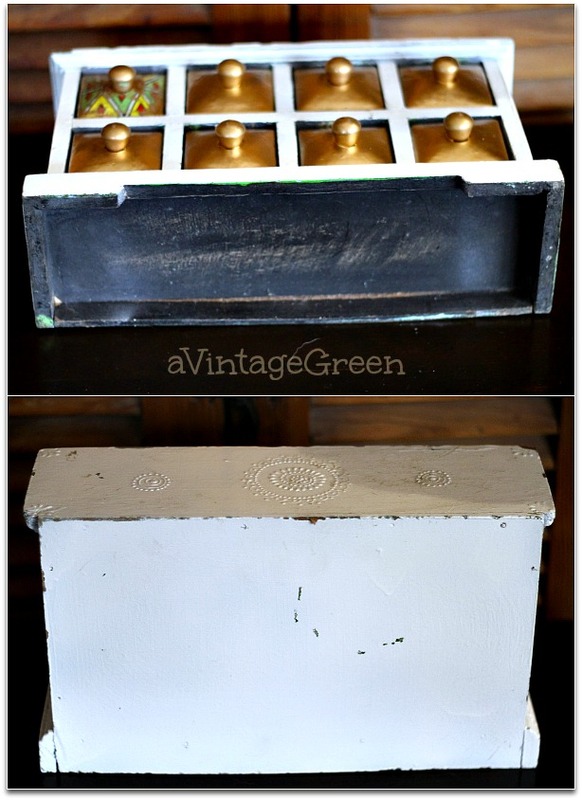 I love how you've refurbished this little cabinet. Thanks so much for sharing at Inspiration Thursday! Hope you have a great weekend! Why would someone paint over those pretty doors? Looks much better now...a wonderful find! That is super cute! Why would anyone paint over such a lovely design! Oh I love when old things are restored to their former glory. Great job! Thank you so much for linking up to Thoughts of Home on Thursday. You make our gathering a happier place. Thank you so very much for sharing your precious time and talents with us at TOHOT. Your inspiration always bring joy to us all. Wow, what a beautiful surprise under all of that paint. Gorgeous! Thanks for sharing with us at Talk of the Town. Wow! Those colors.... That paint stripper! Awesome cabinet! That is a wonderful surprise! What a pretty cabinet! Thank you for sharing your find with us at Snickerdoodle Sunday this week! This looks so pretty with the multicolored drawers! 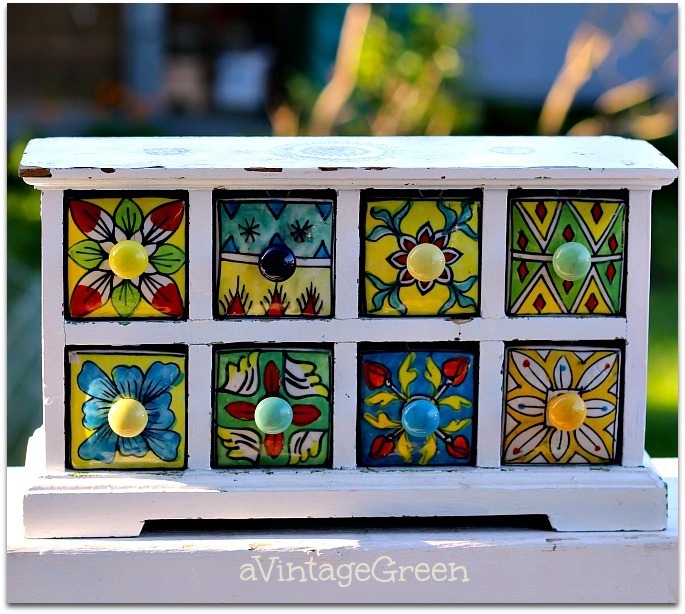 I love colorful little accent pieces like this. A marvelous makeover. This turned out great and can be used in so many different ways. Such a vibrant little cabinet. It would look great on the patio. 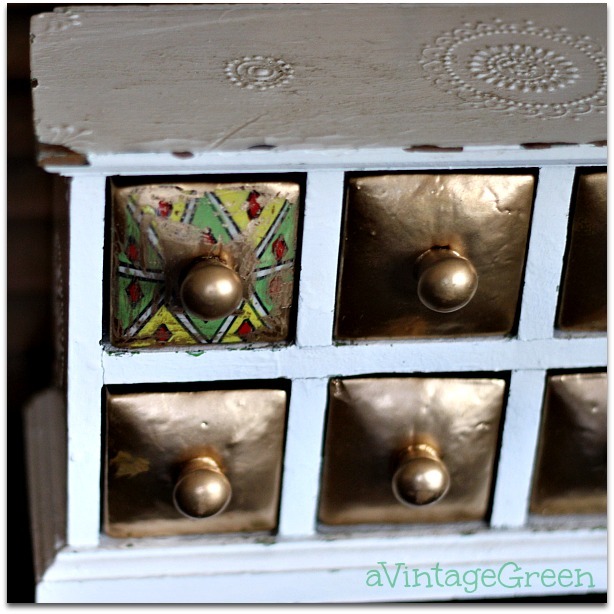 Oh my gosh Joy, who would paint gold over such a beautiful cabinet. It is a wonder that your husband found what beautiful designs lay beneath the gold. The design on the top and sides is lovely too. This is a treasure for sure. Lucky you!!! Thank you for sharing your wonderful "find." Hi Joy, who knew all of that fun was hiding behind that gold paint? Such a fun piece now! Thanks for sharing with SYC. I simply love this little cabinet. How pretty! It looks great now. What a wonderful find. Thanks for sharing at Snickerdoodle Sunday. Pinned. Such a fascinating piece, Joy--you really restored it to its original glory. The pottery drawer fronts are so beautiful--tiny little pieces of art. 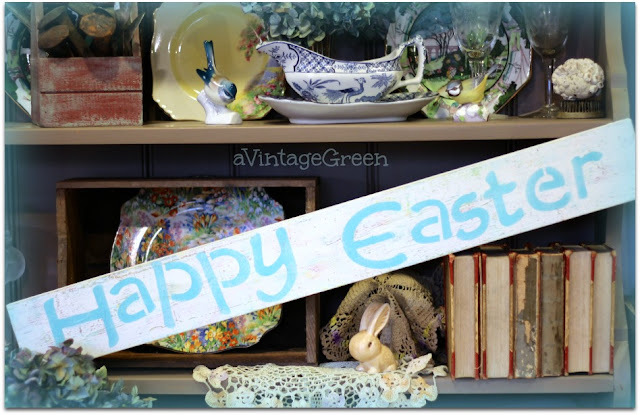 Thanks for linking it up for us to see at Vintage Charm! Joy - what a find! That is truly an amazing little curio!